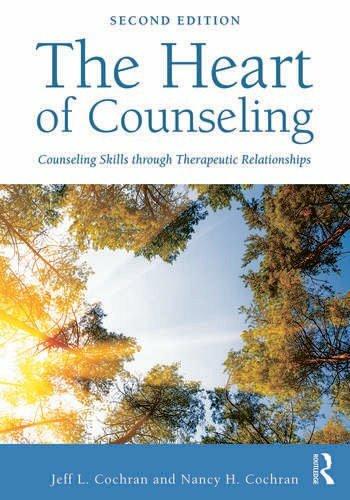 More than any other text on the market, The Heart of Counseling is effective in helping students to understand the importance of therapeutic relationships and to develop the qualities that make the therapeutic relationships they build with clients the foundation of healing. In these pages, students come to see how all skills arise from and are directly related to the counselor’s development and to building therapeutic relationships. Student learning ranges from therapeutic listening and empathy to structuring sessions, from explaining counseling to clients and caregivers to providing wrap-around services, and ultimately to experiencing therapeutic relationships as the foundation of professional and personal growth. Jeff L. Cochran is a professor in the department of educational psychology and counseling at the University of Tennessee. Nancy H. Cochran is an adjunct faculty member in the department of educational psychology and counseling at the University of Tennessee and the treatment coordinator of the UT REACH Project.